On August 15, 1942, the 82nd Airborne became the US Army's first airborne division. Commanded by Major General Matthew B. Ridgway, they trained exhaustively for their new role, which involved parachuting from C-47s and insertion by Waco CG-4A gliders. In April 1943 the 82nd was shipped overseas to Casablanca, North Africa, and on July 9 made its first combat drop as part of Operation Husky, the invasion of Sicily. A second operation—night parachute drops onto the Salerno beachhead on September 13 and 14—provided more experience, and in December the bulk of the division left for the United Kingdom and training for D-Day. 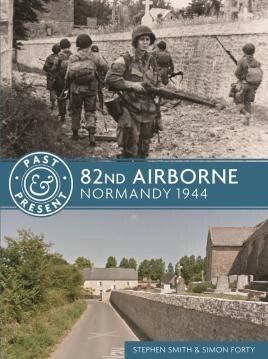 Reorganized with two new parachute infantry regiments, the 507th and the 508th, joining the 505th, the division dropped onto the Cotentin peninsula between Ste-Mère-Église and Carentan on the night of June 5-6, in a mission codenamed Boston. Their glider-borne component, the 325th GIR, arrived the next day. Widely dispersed on landing, the division overcame its problems and strong German defenses to take the important town of Ste-Mère-Église. Further intense action along the Merderet River ensured that the Utah beachhead wasn't compromised, and subsequently the division fought on losing 5,245 troopers killed, wounded, or missing. When withdrawn after 33 days of action, the division could be satisfied it had performed heroically and helped establish the Allied forces' foothold in France. The Past& Present Series reconstructs historical battles by using photography, juxtaposing modern views with those of the past together with concise explanatory text. It shows how much infrastructure has remained and how much such as outfits, uniforms, and ephemera has changed, providing a coherent link between now and then. Having visited the area myself in the past, it is certainly a beautiful part of the world while the history that can still be seen there I am sure will fascinate you. With an RRP of just £9.99 these are excellent value for money, and will be a useful reference to carry with you if you do go and visit. This series of books have been planned and executed by Casemate with panache...They would make ideal Christmas presents for younger history buffs because each volume offers just about enough in a single sitting. I cannot fault them. The titles in the 'Past & Present' series are very much worthwhile having on the bookshelf, as a reference work, or to be enjoyed as a general read. Great value and excellent quality - highly recommended.